All good bud, I'm about to go out at the moment but I'll arrange some single pictures like you mentioned tomorrow afternoon. Hey guys, just a quick update on the situation. I have shared this thread with my contact at ASMED and have been offered a touch up on the frontal area free of charge, this May or April. The number of grafts are to be determined on inspection but I will definitely take this offer up. I'm really happy about this because I really didn't' think anything would come of it. This to me really shows that they not only take pride in their results but genuinely care about their customers. Hi Mick, I am currently at 13 months. I have been updating since 7. You won't see decent results until about 11 months and you'll never notice new hairs popping up. I surely didn't so don't waste your time in the mirror counting specs. One day you just kinda look at yourself in the mirror and notice it's looking better. 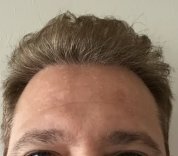 Despite my posts I'm not upset about the hair that's grown, please don't take my tone through this thread as an unappreciative and regretful guy. It's not the case at all! There's no doubt that I'm in a much better position than I was. This is all just a matter of what should be. Plus your results will be different. The regrwoth stage is the worst and a lot of doubt is going to kick in but don't add to it. Be patient and see. It's all good man! You've taken the right steps into fixing your problem so take a breather and loosen up! Hi there, sorry for the lack of updates but it's been a busy few months. Check out the attached images I took today. It should be noted that I got a haircut but I think it shows more clearly the density it has reached. It has now been 16 months since my transplant and honestly, I'm still not 100% satisfied with the results. The density has not reached what I had hoped or what I was told it would achieve. It's still quite thin at the front and i still have to push my hair aside to try and cover it up. People do still look up at my hair because they notice it's thinning so I know it's not just me. And as mentioned before it doesn't look like 3000 grafts at 75 caliber microns But I should note that I don't regret getting it done. Looking back I can clearly see that if I had done nothing I wouldn't even have a hairline to brush and I'd be a lot more self conscious about going out if at all. It's clear to see how far my fringe has come in pre v. post image and I'd much rather be styling thin hair than not. My main issue comes with the 90% regrowth grantee. I, like a lot of us, have paid a lot of money to go overseas and see a top class surgeon but I just don't believe that this is 90% regrowth. Maybe You guys can weigh in? But before you do PLEASE don't just tell me my hair looks good and not to worry about it. It looks lot better in the photos plus the hairs are still quite frizzy. This isn't just my expectation vs reality, I need an honest opinion if you think that this is 90% regrowth. Lastly, I will share this page with ASMED now because when I brought up the density back in September they asked me to wait a few more months for the hairs to develop. Thanks! Thanks for sharing your story. I've had a good read of your thread and I'm happy Asmed committed to helping you. Your hair looks so much more natural now. I just hope that my hair will change like they said in the coming months and that I can have a more confident hair line. I'll post results in a few months and let you guys know how it's going. Hey Melvin, sorry for the delayed response. My hair is usually like this when I have it brushed to the side with a bit of product and hair spray. It looks okay in this picture but in any kind of direct light you can see gaps. You can even notice the thin area on the side of my side fringe. It's a little frizzy when I just leave it naturally so the gaps are wider. The surgery has no doubt given me some of my hair back and I'm grateful for that but not as much as it should have I think. Could I see what it looks like at the 12 month point vs the 23? Hey guy's, as a long term reader and first time poster I'd like to finally post some pictures of my progress since my transplant back on September 5th 2017. I was meaning to do a month by month update like a lot of people have but I avoided that. Before having my surgery with ASMED I was very confident I’d get great results and I never really stressed or doubted the procedure because of their success rate and I told myself that I wouldn't need the reassurance of progress pictures because of the simple fact that it would work. Unfortunately, I fell victim to doubt and started comparing my hair to other user's a few weeks ago and thought I wasted my money. I hadn’t really noticed any baby hairs growing and I do check it every now and then but unlike a lot of users where the newer hairs are obviously growing within, I just haven't gotten that. I did feel a few pricks in my hair a few months ago but that was it. I contacted ASMED and sent some pictures and they assured me everything was proceeding fine. I didn't really believe it until I gathered some before and after pictures and looked directly at the progress. Wow was I wrong. I mean the density isn't where I’d like it to be yet and it is quite frizzy at the moment but looking at my pictures I guess I didn’t realise how thin my hair was pre op. I would like to one-day push my hair back as I’ve been hiding the thinning with a side fringe but these pictures really made me appreciate where I might have been of not for the transplant. If you’ve heard about ASMED you know they’re great and very caring and I’d without a doubt recommend them to anyone looking to get a transplant too. There are very few people who know about my surgery so I don’t have many people to talk to but I guess I’d like for this post to help encourage other people to stay positive and definitely keep up the progress pictures because I will from here on out.